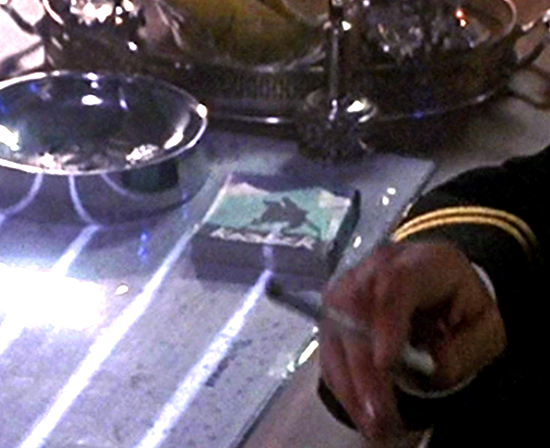 I had never noticed it until tonight, but the ship’s “Political Officer” Putin (played by Peter Firth, whom you may remember as Colonel Caine from Lifeforce) is smoking in Ramius’ cabin, and on the small table beside him is what appears to be a pack of cigarettes (naturally). A little Google Image Searching shows that they are Kazbeks, an unfiltered brand allegedly preferred by officers, which contrasts nicely with Putin’s apparent disdain for Tupolev’s descent from aristocratic stock. Kazbeks do not have an English Wikipedia page, but they do have a Russian one. Additionally, these are clearly different than what the Red October’s chief engineer, Lt. Melekhin, offers Ryan later on the bridge. Unfortunately, Kazbeks come in a few different, subtle pack art variations, and without a much clearer images, we will never know exactly what package was on that table. They do appear to be in production currently, but the package shape and art have both changed substantially.